← What are our Drama Queens up to? Cast member, Emily Clark (Emily Jordan) is bringing back the show that inspired Slightly Dramatic, the Web Series, and SD writer/director, Jeff Scot Carey, will be performing as well! SLIGHTLY DRAMATIC, the show that spawned a web series, and inspired an entire generation of young people, returns on September 26th at The Complex in Hollywood. 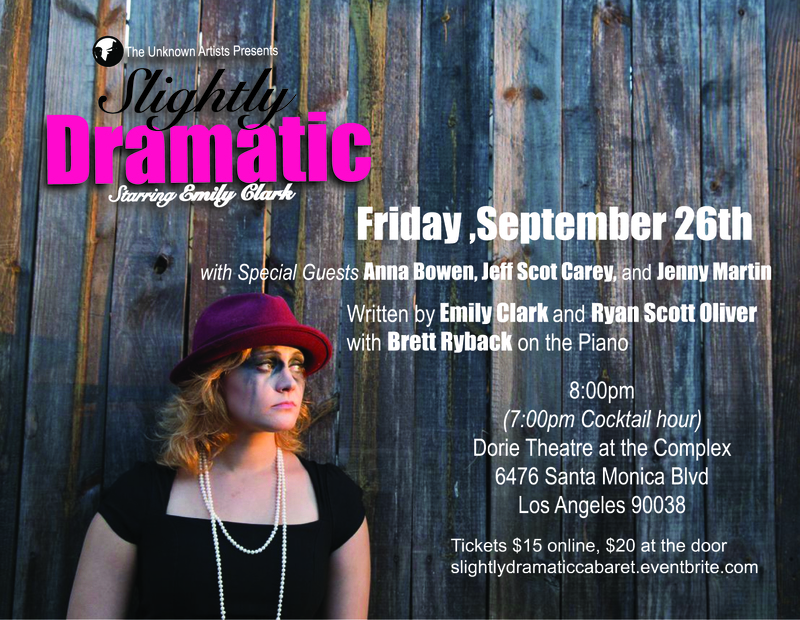 Catch Emily Clark in her semi-autobiographical cabaret and learn of her semi-triumphant rise to semi-stardom. Featuring a book co-written by musical theatre phenom Ryan Scott Oliver (Jasper in Deadland, 35MM, Mrs. Sharp), with Brett Ryback (Off-Broadway’s Murder for Two) tickling the ivories, Emily will bring you true-to-life tales about dead dogs, mean girls, bipolar boyfriends, and Bernadette Peters. This show has something for everyone…if you’re a Broadway geek, or a gay man, or lived through the 90’s. Or all of the above.